On Monday evening, Jewel Pickertt, a Hasting resident and independent writer, came before the council during the public statement portion of the meeting with her statements that chastised Councilmember Tina Folch, for what she believed to be inappropriate remarks made during the April 1st meeting. Pickertt read from a prepared statement that conveyed her position that Folch had made comments that were unfairly disparanging to both city staff and the council in her presentation of the solar subscription proposal. Pickertt also suggested that Folch had abused her authority in naming specific staff members that were considered to be uninformed in the complex topic . She ended her comments with the request that Folch use better communication tools to make her position known, use a balanced, fair approach in her statements and discard what Pickertt termed a political agenda in her position. She also called for Folch’s replacement if the practices continued. 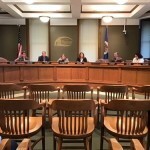 In the comment section at the end of the meeting, Folch directly responded to the statements made by Pickertt, citing an agenda of her own that was based on support of Representative Tony Jurgens. Jurgens and Folch campaigned last fall for the House seat. Folch cited a position of Pickertt’s and requested that if she had differences in how she represented her ward, to bring it to her in a one on one situation. The two also shared words following the end of the meeting which were not disclosed. There were no comments on the statements made by council.